India’s wildest and least explored state, Arunachal Pradesh (‘Land of Dawn-lit Mountains’) rises abruptly from the Assam plains as a mass of densely forested, steep hills, which eventually top off as snow-capped peaks along the border of Chinese-occupied Tibet. Much of the state still remains beyond tourism’s reach, but new areas - lush river gorges and craggy mountainscapes - are slowly being opened to visitors. It took the surprise Chinese invasion of 1962 for Delhi to start building roads up here(the Chinese voluntarily withdrew). These days, border passes are heavily guarded but the atmosphere is generally calm. Compared to some neighbouring states, Arunachal remains relatively untouched by political violence. Led by the intrepid Tadar Robin of Mercy Tours & Travels from Itanagar, three foreign travellers set forth on this epic road journey, over 400 km each way, from Guwahati, capital of Assam State, and began the climb up into the Himalaya. After two full days of jolting along what could easily be called the worst road in the world, we emerged into a landscape of magnificent blue mountains guarding the ancient town of Tawang. 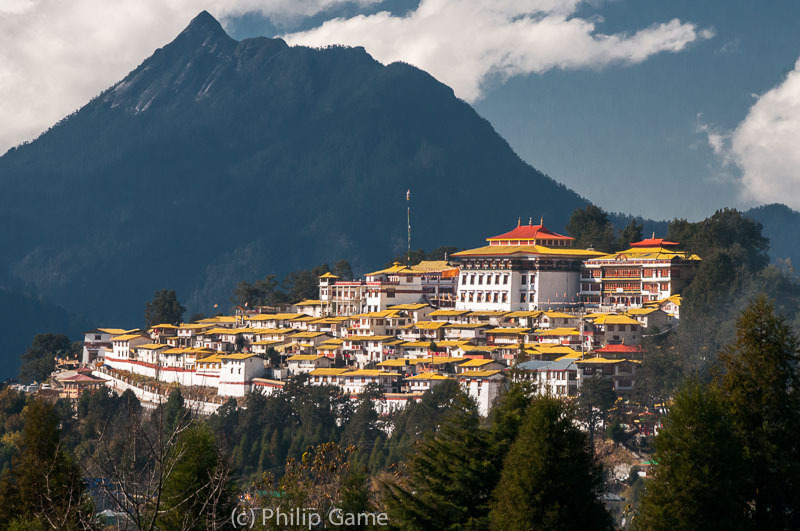 Tawang is notable for its large and venerable Buddhist monastery, founded 1680 AD and perched on a ridge 3,000m (10,000 ft) above sea level. Reaffirming their close cultural ties to Tibet, the local Monpa people were preparing to welcome - with great enthusiasm and extravagant festivities - a visit from His Holiness the 17th Karmapa Lama, a much-revered Rimpoche or reincarnation, according to Tibetan Buddhist belief. Most of these images were taken with Nikon D300 using RAW format, and are available for licensing. Please visit www.travelgame.org or my blog. 24 Feb 2017. Thanks to the courtesy of an Indian Army officer who found my missing mobile (cell)phone at a roadside halt, and took the trouble to mail it back to me, I have added a few more images. The Big Day Out: do these two represent a different tribal group? A great journey through fascinating lands.